They are wearing evenly. I have rotated them once so far. The sidewalls and treads have held up really well considering the abuse I have subjected them to. No major chunking or loss of lugs. I just checked and am surprised to find out that with 11,000 miles, the current tread depth is at 12/32" (67% of usable). At this rate, the tires will wear out before I get 20,000 miles on them. And considering that I usually replace tires at 50%, they may only see a few more thousand miles on my truck. Granted, the percentage of miles in the dirt and in 4wd for my truck is very high (no daily commutes and lots of overland trips) but that is pretty dissapointing and will make this a very expensive set of tires. So my opinion as of today - is that they are great tires if you can afford the short lifespan. I am currently using the Cooper STT tires for the Tacoma. These are my favorite tires for this truck so far. Once again I am using the 32x11.5x15 size on the stock alloy wheels. 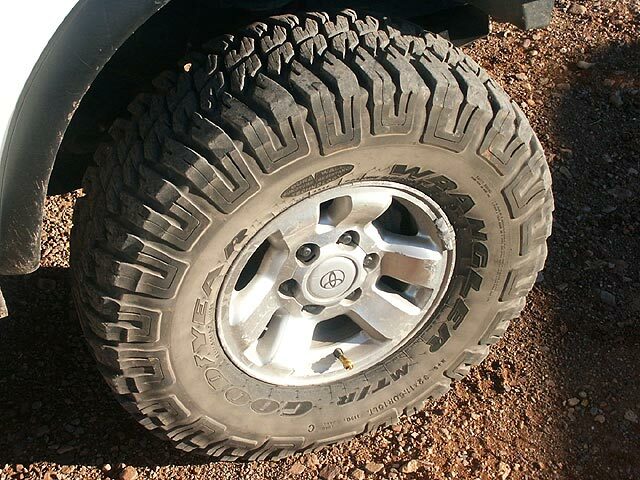 These are a Load Range "C" tire and are "M + S" rated (mud + snow). The truck is likely weighing in the low to mid-5,000 lbs. range with even weight distribution from front to back. Thus far, I am extremely happy with the Cooper STT tires. Besides the obvious pavement, I have tried them in the rain, snow, sand, and all manner of off-road trails including moderate rock crawling. I haven't had them in treacherous mud yet, just light mud that goes along with snow-melt or monsoon rains on trails. In all conditions I have had them in, they have performed really well. They excel at slow rock crawling traction, though my truck is built for more expediton-style and overland travel. They "hook up" and stick very well for my truck. This may have something to do with the GVW of my truck, as I have a great deal of contact pressure. I was also really happy with them in the snow. I managed to drive some roads and trails where I broke the first tracks, and they did very well. However, I have not had them in snow deep enough to fully test them to the point that forward progress is halted. I imagine my truck will plow before the tires give in. As far as rubber durometer is concerned, I think they are probably not quite as soft of a tire as the Goodyear MTR, which were my previous set of tires. These tires have balanced well and are nice and round (no hopping on the road). I would expect to get 35,000 - 40,000 miles out of these tires. However, I usually replace my tires at around 50% tread depth so I will just measure remaining tread and when at 50% will check the mileage and double that to see what the actual lifespan of a set of tires on my truck is. The last set I had (Goodyear MTR's) were at 20,000 miles with 50% useable tread remaining. I expect the Coopers to do at least that good. I have also experienced a slight increase in fuel economy over the MTR's. Probably around 1-2 mpg with mixed city/hwy driving. I might add that I checked the mileage referenced above, on a recent 5-day trip from AZ to CO with mixed driving conditions. I managed to get a few tanks of fuel to average at 17mpg or above, and one tank at 18mpg. The best I had been able to get with the MTR's was about 16.5 with an occasional tank at 17 or better, and sometimes as low as 13's. Also, I really liked that fact that these tires came with factory siping across the entire tread width, which saved me some $$ from having to add siping at the tire shop. The factory sipes are perfectly centered in the tread blocks (where the siping machine is indiscriminate on placement) so I have had no tears or chunking due to the sipes which is nice (which is not to say I don't have some random rash and cuts on them). When these tires were brand new, I experienced some odd steering feedback. My guess is that the chiseled, meaty sidewall lugs on the brand new treads were making contact with the road surface under moderate to heavy braking conditions, or when shifting at high rpms (torque drops, front end drops before next gear commences), due to the rubber flexing. Now that the tires have had a chance to wear down a little, the condition has just about dissapeared but is not entirely gone. 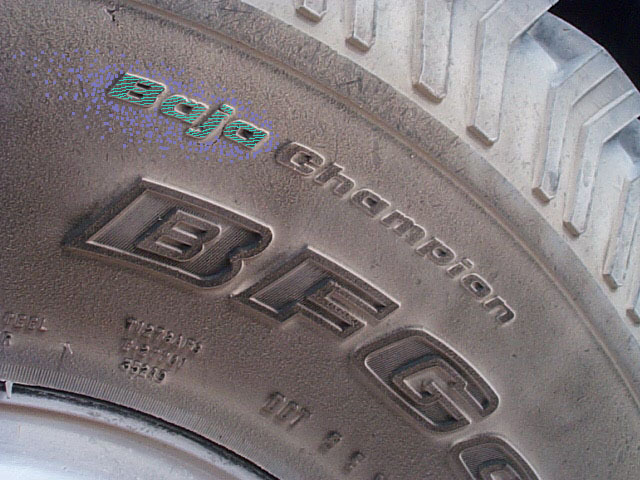 In December of 2003, I replaced the BFG tires with a set of Goodyear MT/R's. And I siped these as well. I decided to run the MT/R's this time around so I could have some fun with them on the rocks. And I definitely have had some fun with them! 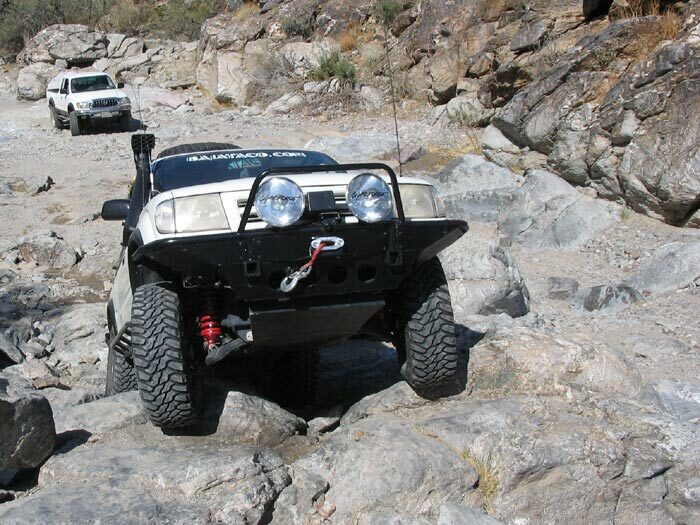 The inaugural run was to a remote spanish mission site in Baja, that required traversing some really jagged and also loose terrain as the trail neared the mission site. I can remember how good those new MTR's felt on the jagged rocks, cushioning the ride and gripping like crazy on the various boulders and decomposing granite. I must say that I really enjoy the MTR tires out on the trails. On the road, they leave a little to be desired when compared to the BFG's. The set that I have do not balance very well, and they also resulted in a decrease in gas mileage (probably 2 mpg or so). No doubt this is due to more rolling resistance and a softer rubber compound. I had a little bit of chunking due to the sipes, but not enough to really be given much consideration. The tires had approximately 11,000 miles on them when the above photo was taken. I was lucky enough to win a set of Staun tire deflators at a raffle during AZROCKS (a Tacoma-oriented 4-wheeling event organized by AZTTORA). A big thanks to Mike at Xtreme Off-Road for donating the deflators. These little gems are great for quickly deflating the tire from ordinary street pressure, to a lower pressure for trail use. This lower pressure is adjustable, and can be customized for your specific tire and desired deflation. Originally, I decided to mount some 32"x11.50 BFG All-Terrain tires on the stock 15"x7" alloy wheels. I had these tires machine siped. A lot of people are against siping these tires, as they already have some factory siping, and I guess some people have problems with the rubber chunking off. 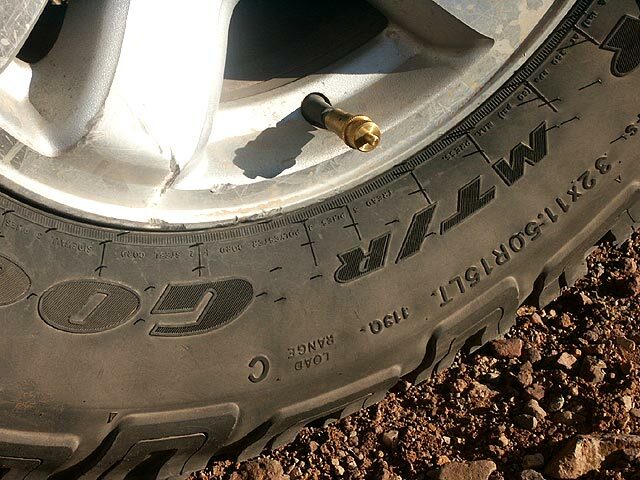 But I never experienced that problem, and gave the tread every chance to chunk if it was going to. I ended up putting approximately 35,000 - 40,000 miles on these tires with over two years of use on the Tacoma. I was really impressed with how well these held up. 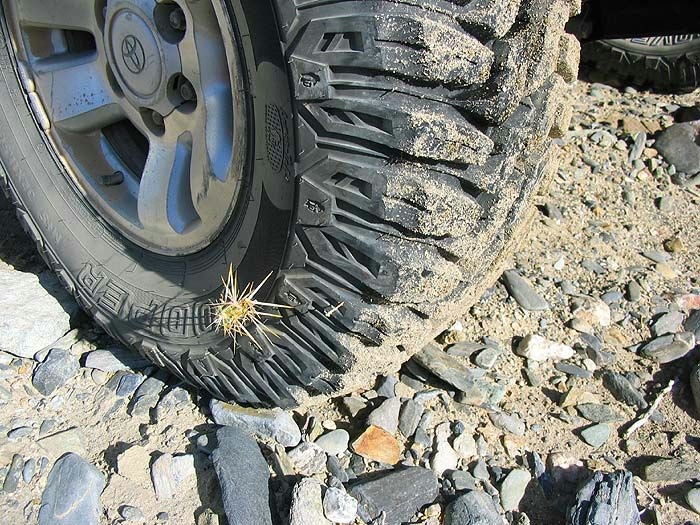 I continually abused these tires out on the trails and they never seemed to complain. I never had a flat despite all of the bad roads and running the rocks while aired down, and folding the sidewalls like quesadillas. They continued to ride very well on the road too and stayed balanced and wore evenly. I would not hesitate to buy the BFG All-Terrain tires again. I was very happy with them, and in my opinion, they are an excellent tire.